Across Dorset and Hampshire, we’re among the leading accredited home CCTV camera systems installers. Our high definition systems provide a smart and secure solution for ensuring your property is covered in all aspects whilst being able to view the live feed or recordings of the video from a remote location. Images are saved digitally via a secure broadband connection. The advance in technology now means that manufacturers produce network cameras capable of recording high definition recordings at a high frame rate, compatible with HDTVs. Playback recording and search functionality at the touch of a button, with different camera sites being linked to the same network for ease of use. This saves time and means you can find recorded events at the touch of a button if evidence is needed. With greater access to the internet nowadays, you’re able to watch the live video feed as it’s happening, and also view previous recordings online via a PC, tablet, or smartphone. This technology gives peace of mind and better surveillance long term. IP CCTV systems can co-exist on the same cabling as any previous CCTV system, and also with other IP based systems such as door entry or an IP phone system, for example. Time is money, and these systems don’t take long to install. 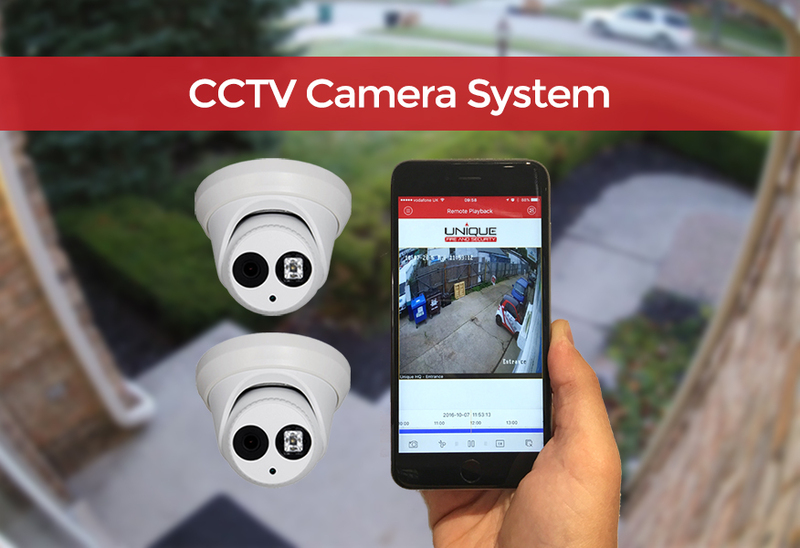 Our home CCTV installers make sure you have full remote access to the live video feed of your cameras so you can view them from anywhere in the world. Just make sure you’re connected to the internet on your smartphone, tablet, PC or laptop. We understand that you or your family can’t always keep an eye on the live feed, day and night, so we’re partnered with a Remote Video Response Centre (RVRC) to ensure that any detections are acted upon quickly and emergency services contacted. The RVRC must respond to detections within 90 seconds, at least 80% of the time, so with cameras monitored 24 hours a day, be assured that any suspicious activity and attempted break-ins are dealt with as a matter of urgency. It’s vital that maintenance servicing is regularly adhered to with CCTV cameras, even with low-impact wireless systems, they still need to be thoroughly tested. It’s worth the small outlay each year for peace of mind that when your system needs to be called upon, it’ll deliver as expected. Telephone support as standard, and remote access capabilities from our CCTV installers based in Poole, Dorset, so you have instant support minimising downtime of your system. A 24 hour a day emergency response service available 7 days a week, 365 days year. We can guaranteed one of our engineers will be on site within 4 hours (it’s usually much less). Fully equipped CCTV installers who keep all relevant spares and tools to ensure no return visits are required – further minimising downtime of your system. We repair and service old CCTV camera systems too. Our maintenance servicing contracts aren’t just for customers we’ve installed systems for. The knowledge and experience our CCTV installers have using a full range of systems mean that we’re capable of servicing and repairing any damage, regardless of age, condition, or technology. A full report indicating all the checks and repairs to be carried out on the system will be drawn up, with any chargeable items agreed before any work’s carried out. Transparency.